Our Disney World vacation was officially underway. 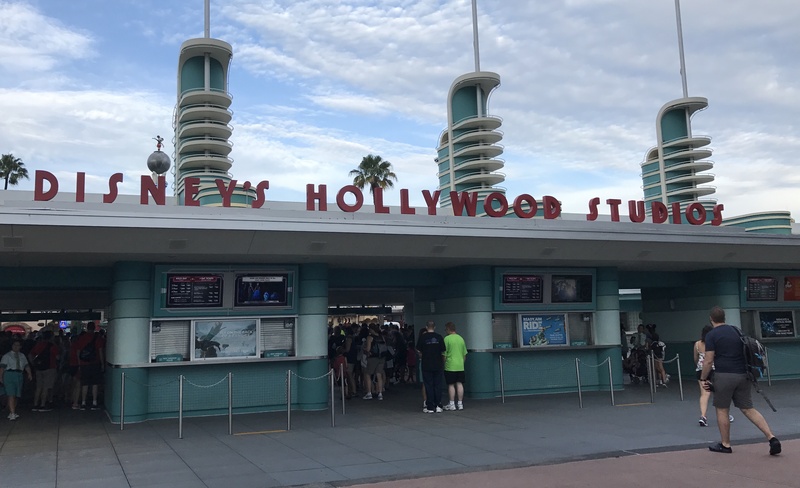 Up bright and early to catch the bus from All Star Sports hotel, we made it to Disney Hollywood Studios before the park even opened. I was already seriously impressed. 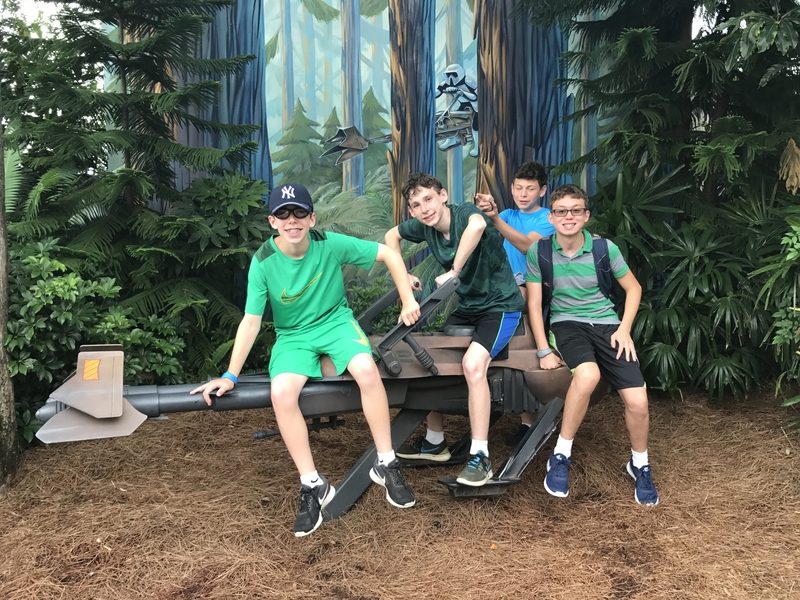 No, not at the crazy cool awesomeness that is Disney, but at the fact that my wife Allison had managed to get all eight of us up, dressed and at the park so early. Getting me, Jason and Ryan up is one thing, but she also got her cousins Ivy and Ira (and their two boys Matt and Ethan) into the solid vacation routine. We were all one tired, well-oiled machine! While I had been to Disney World back in the ’80s, this was my very first trip to Disney Hollywood Studios. For those unfamiliar with how Disney World and how all its parks work, there’s a system called FastPass. Everyone who has a ticket for the day can choose up to three rides or attractions to FastPass. You’re basically reserving a space in a FastPass line for a one-hour period. When you get to the ride at your designated time, you get to go on the FastPass line which is always much shorter and moves way faster. 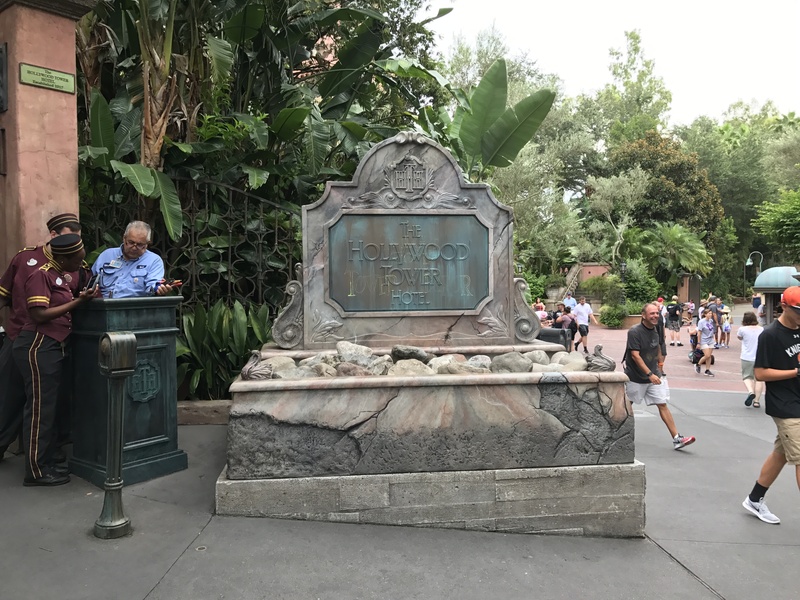 You can pick additional FastPass selections after you’ve finished all three of yours, but if enough people have already booked a FastPass on a specific ride (i.e. the really popular ones), you don’t have much chance. 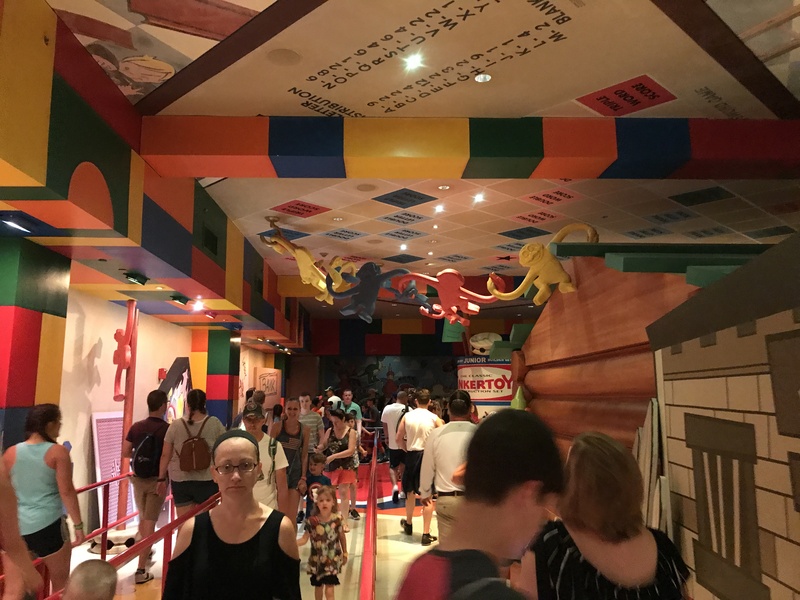 Having already scheduled our day around the three FastPasses, we knew that we’d start the day by going immediately to one of the more popular rides that we hadn’t chosen. This way we’d still have to wait on the normal line, but as the park just opened, it shouldn’t be too bad. As soon as the magical music began playing and the crowds starting moving, all eight of us bolted for Pixar Place and the Toy Story Mania! ride. What makes everything at Disney World amazing are the details. Every tiny little thing is part of the entertainment. 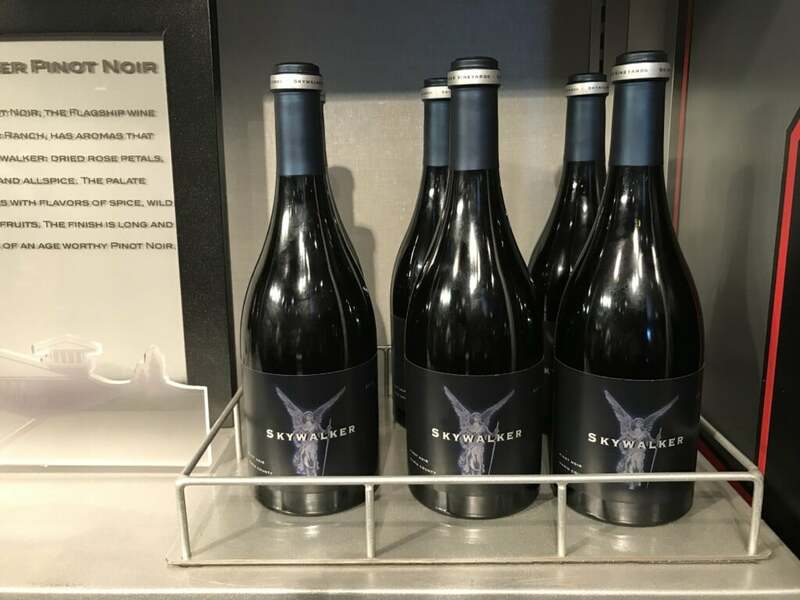 Disney knows that you’ll be waiting on long lines, so they try to make even that exciting. Here you can see we walked through all sorts of toys from TinkerToys to Scrabble to a barrel of monkeys! Allie and I sat in the car in front of Jason (right) and Matt. 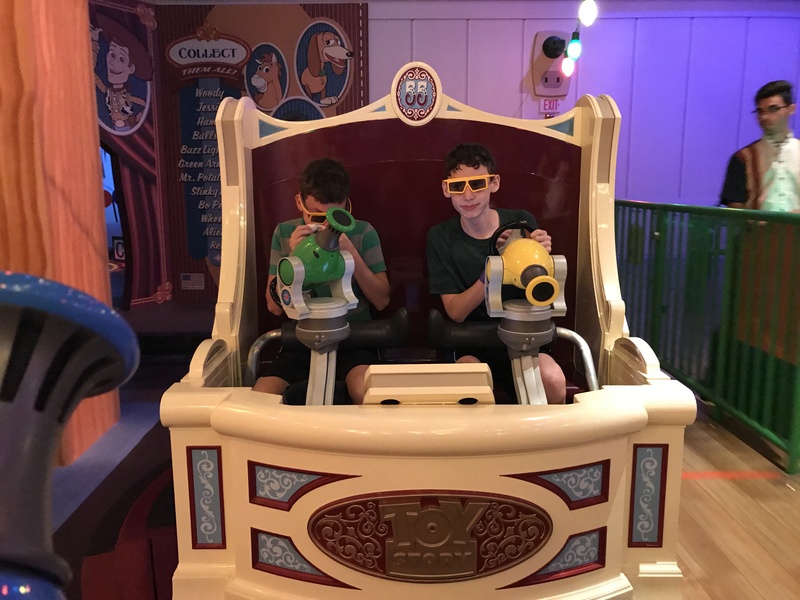 The point of this ride is to shoot your funky laser at all sorts of targets around you, as you move through the ride. You pull back on the gun to “shoot,” rather than just pulling a trigger. To me, that just added to the fun. 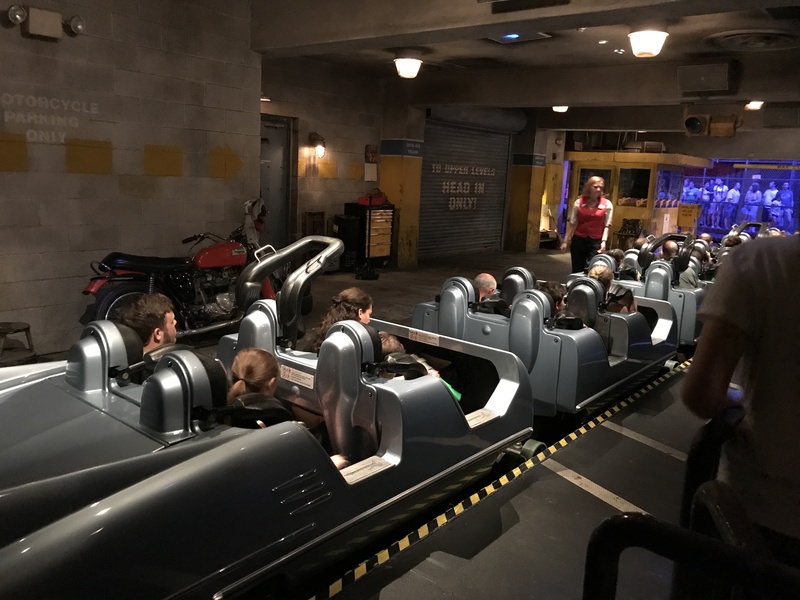 I was seriously impressed with our first ride at Disney Hollywood Studios. It was a lot longer than I thought it’d be and the actual game mechanics were great. You really could aim and shoot in this frenzied game of shoot-like-crazy-to-outscore-your-opponent. 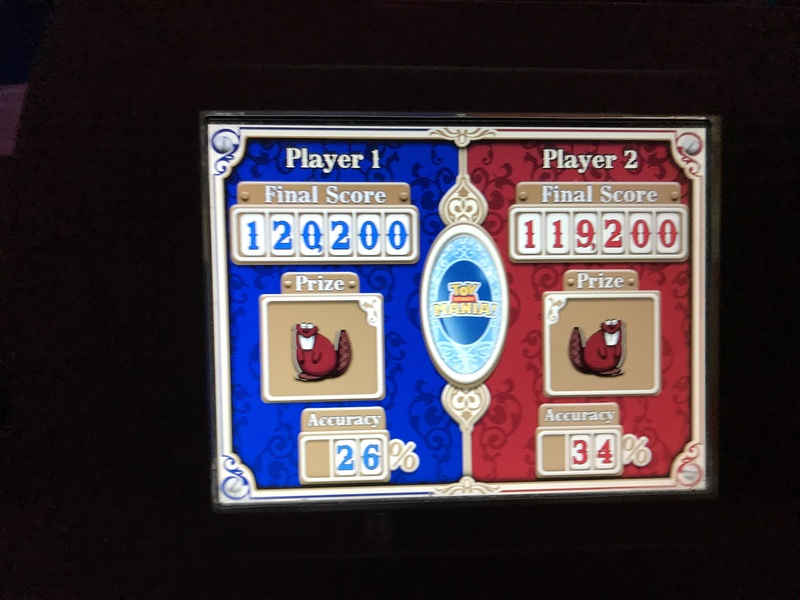 Not only did I beat Allie (though apparently she has a lot better accuracy than I do), but my 120,200 points was the high score of our entire group! 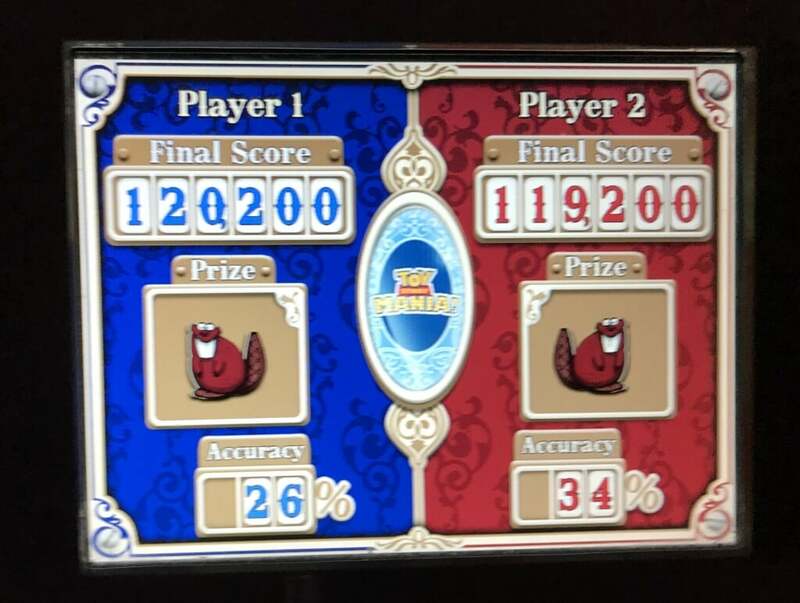 Upon exiting Toy Story Mania!, I saw the best thing I could from our entire trp. 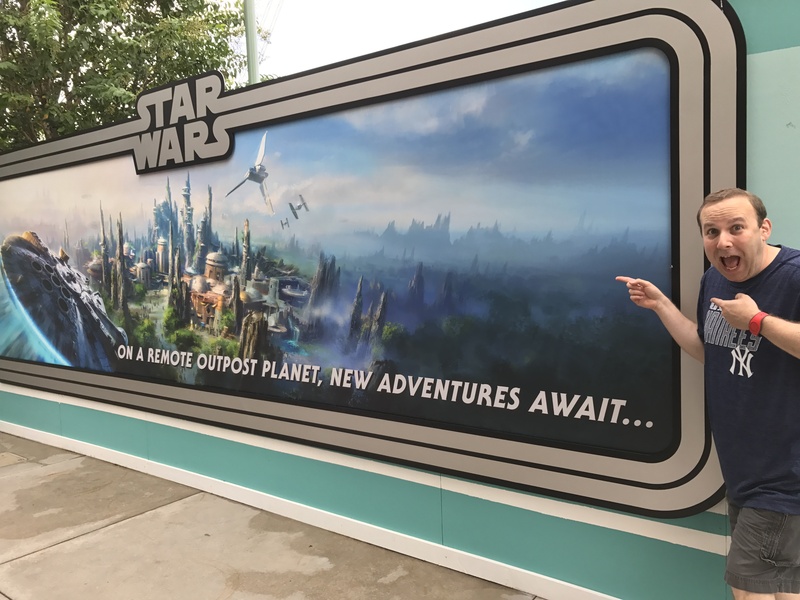 Yep, Star Wars Galaxy’s Edge is the all-new section of Disney Hollywood Studios, that’s coming in 2019! Behind that wall was a galaxy far far away! And I saw the cranes to prove it! Next up was the Twilight Zone Tower of Terror! Freefall rides and rollercoasters are really not my thing. Like, at all. The Twilight Zone, however, is my thing. I love the show and because of that, I put my fears aside and decided to join Ivy and the boys on the ride. 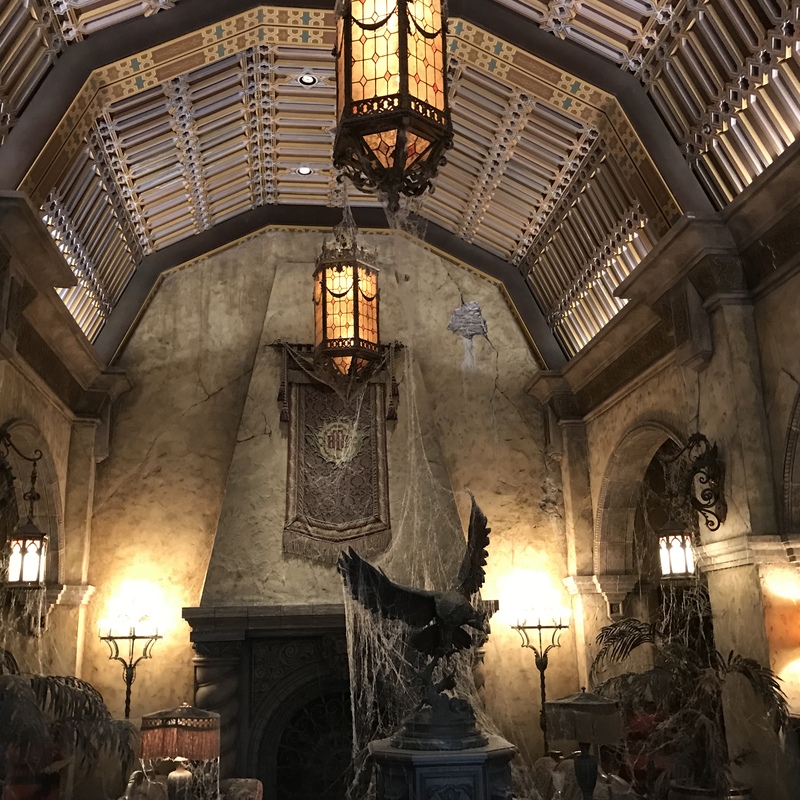 The lobby was all spooked out with old creepy lights, statues and apparently could use a little dusting. 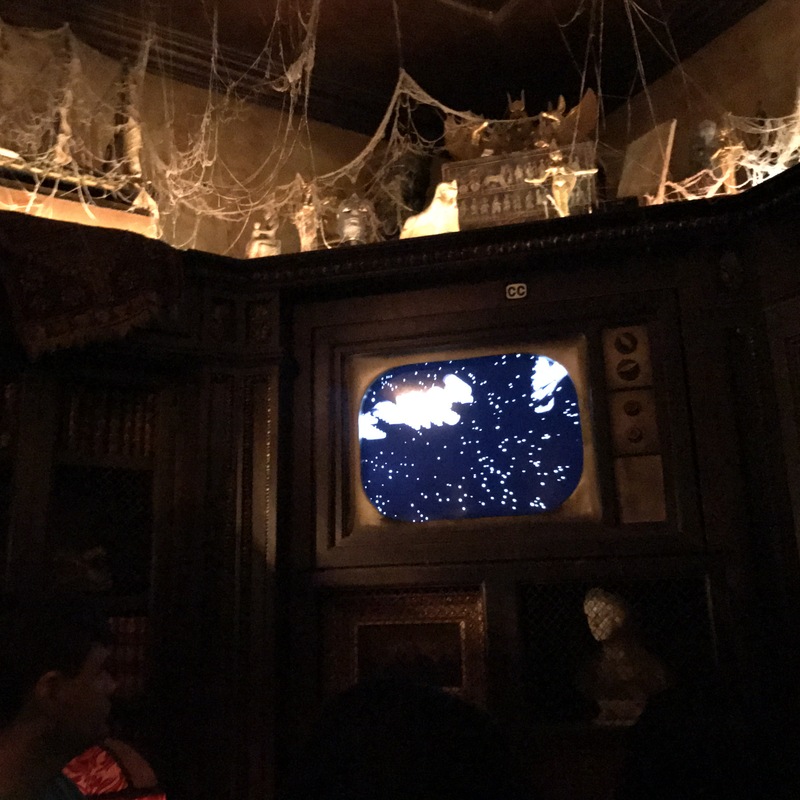 To kick things off, we watched a Twilight Zone-esque intro on the TV screen, talking about how this old building was haunted. We were then escorted through various walkways until we got to an elevator. A pretty big elevator as it probably fit about 50 people, all with seats. And, uh, seatbelts. Definitely not a good sign! The ride itself was pretty neat. It actually moved around and at one point you felt like you were in the Twilight Zone’s intro as we were completely surrounded by stars and giant eyeballs. Then you hit a point where it’s elevator action time and the freefall begins. Up and down. Up and down. Definitely not my favorite part of the ride, but it wasn’t as bad as I thought it was going to be. And just like that, I had survived my first fearful ride at Disney Hollywood Studios! 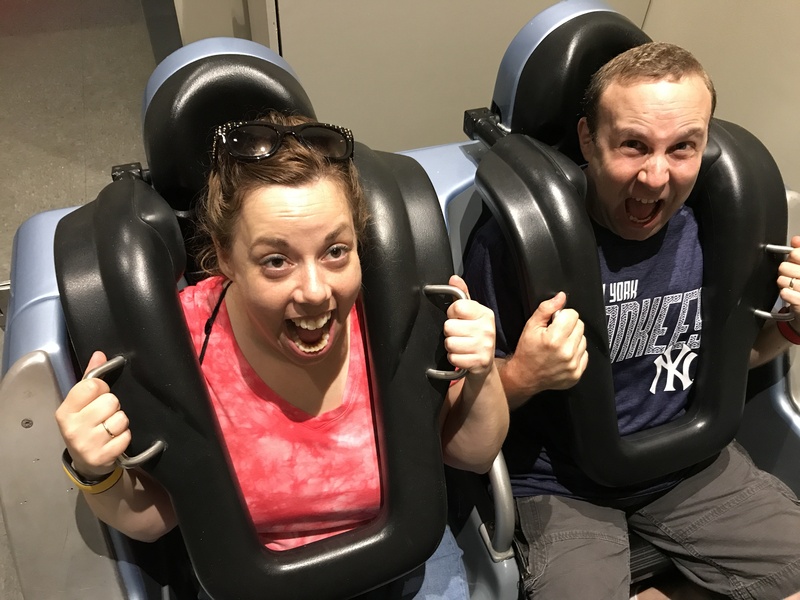 After the Tower of Terror, we decided to get even more scared by walking next door to the Aerosmith Rock ‘n’ Roller Coaster! After a fun studio intro by Steven Tyler and the rest of the Aerosmith gang, riders are herded into some super long stretch limos. We had to get to the concert in record time, so what better way than to travel by super speed? Yeah, the Rock ‘n’ Roller Coaster is fast. Like REALLY fast. Allie and I took a deep breath and buckled in as we prepared to see our lives flash before our eyes. Okay, okay. Fine. You caught me. Look closely in the background and you’ll see this isn’t really the ride. We waited with the kids until the last minute and then headed out the “chicken” door. On the way out, there was this pair of seats from the ride that we couldn’t resist trying out. 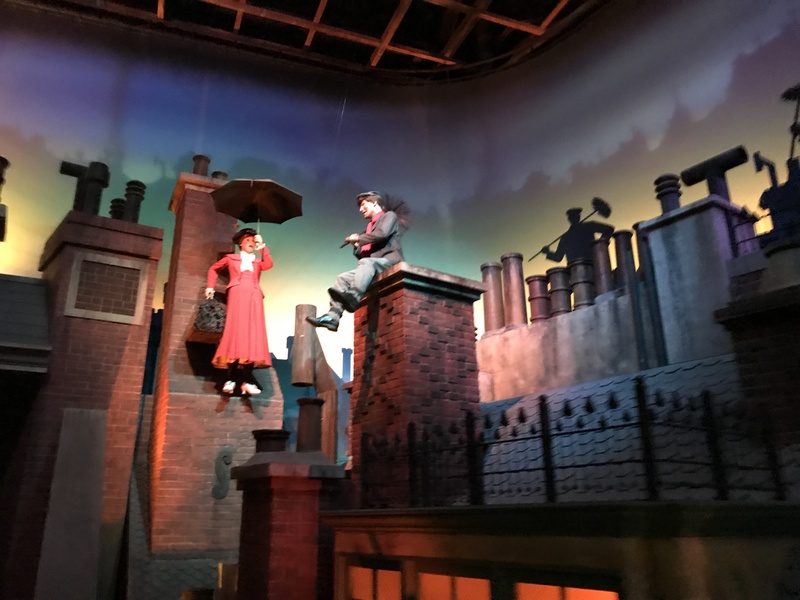 Time to slow things down a little bit with The Great Movie Ride! 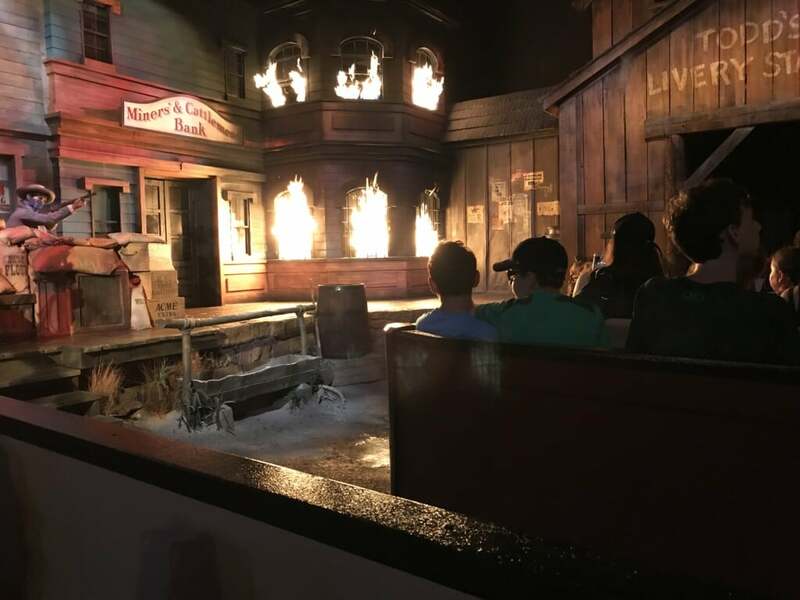 When you’re at Disney Hollywood Studios, you just have to go on a ride all about Hollywood, don’t you? 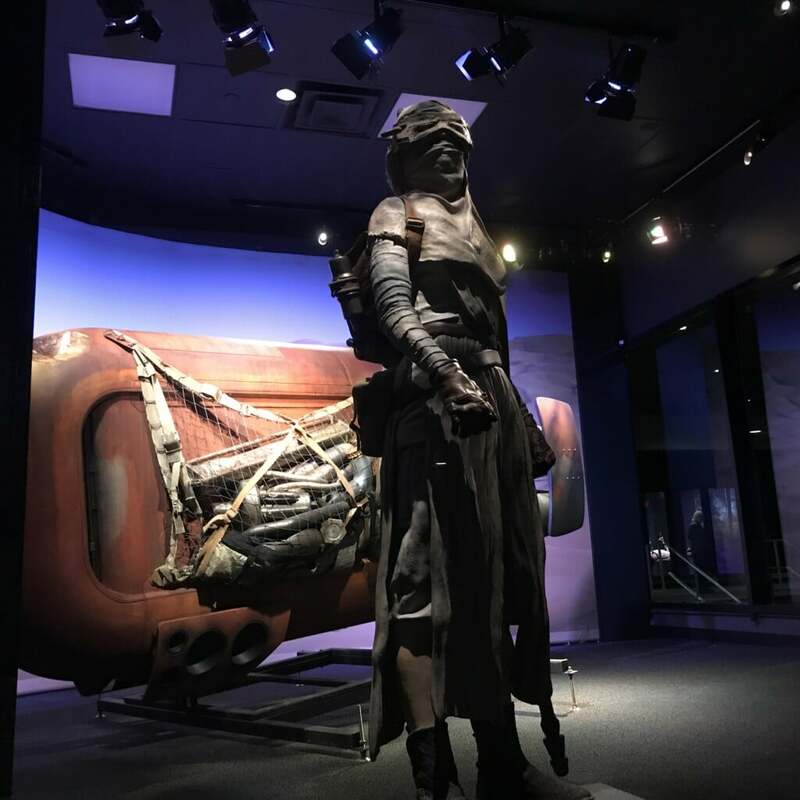 Again, while waiting on line, we got to see some pretty cool artifacts from some of Hollywood’s most famous movies. 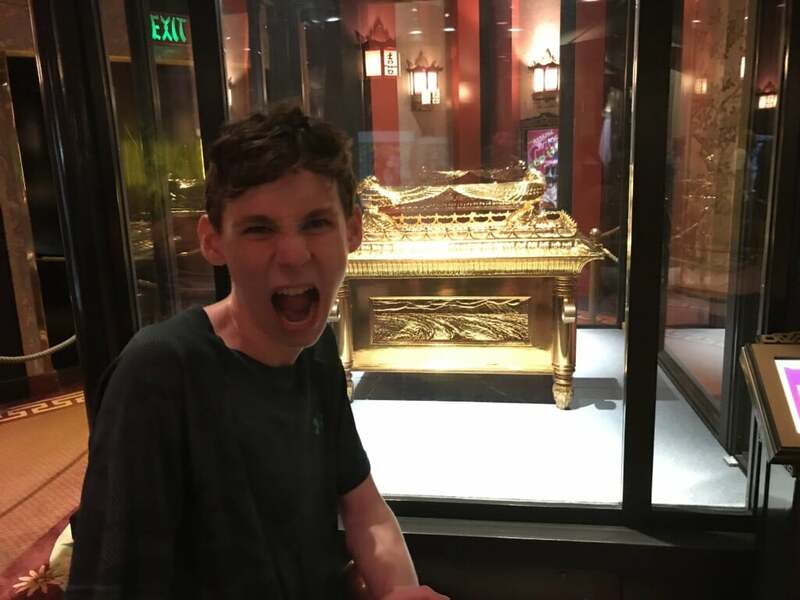 Like the Ark of the Covenant from Raiders of the Lost Ark! I warned Jason not to open it! Luckily we closed it in time before his entire face melted. The ride itself isn’t fast. There aren’t any sudden drops. And it doesn’t go upside down. Definitely something my speed. 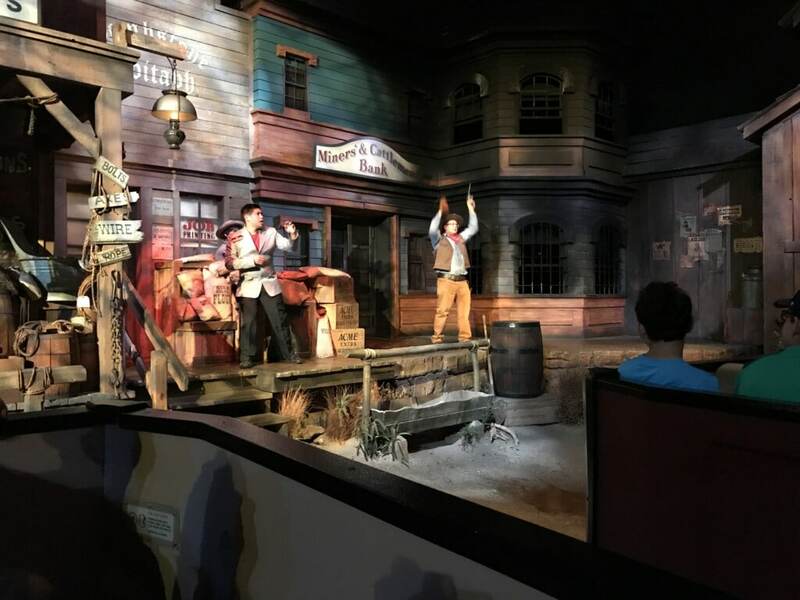 Of course, at some point in the ride, real humans interact with the scenes in a fun, cheesy kind of way. There are even explosions and real fire! We definitely felt the heat from our seats. 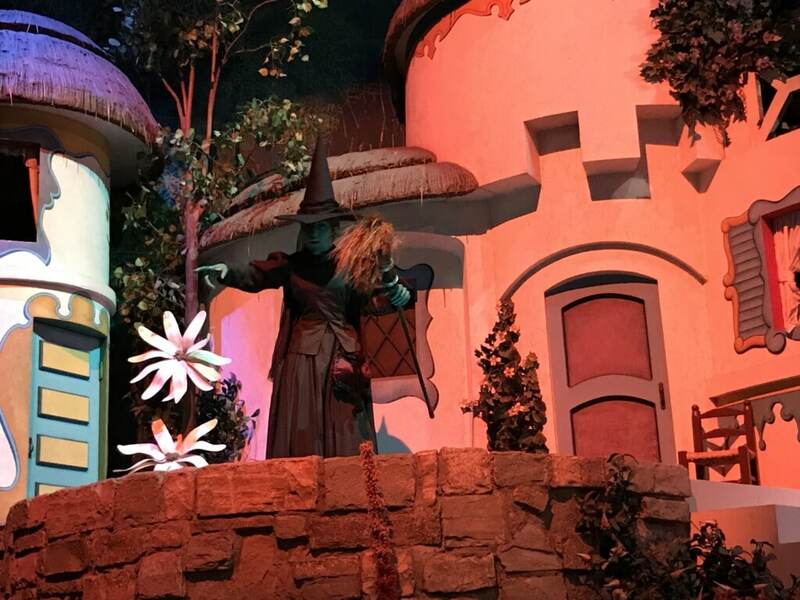 My favorite of them all was the Wizard of Oz setting, complete with spookerific Wicked Witch! 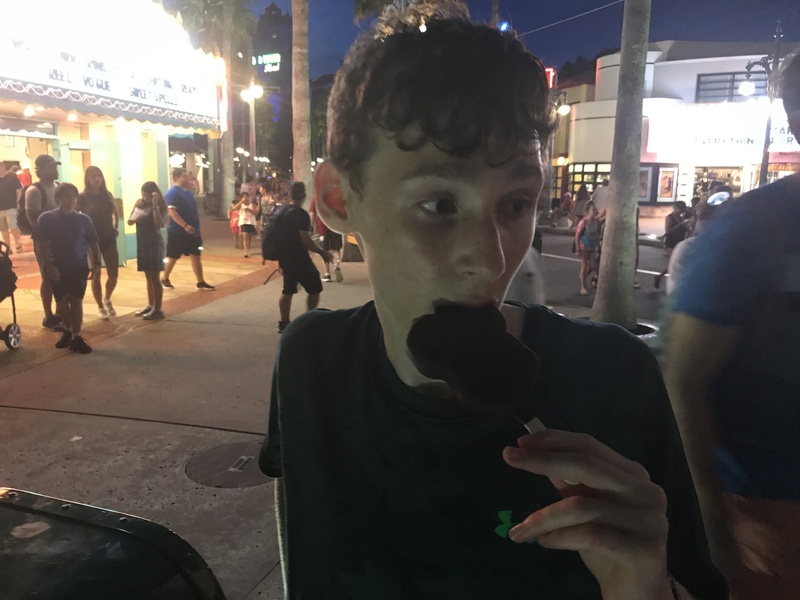 Now it was time to finally see what I had come to Florida to see. 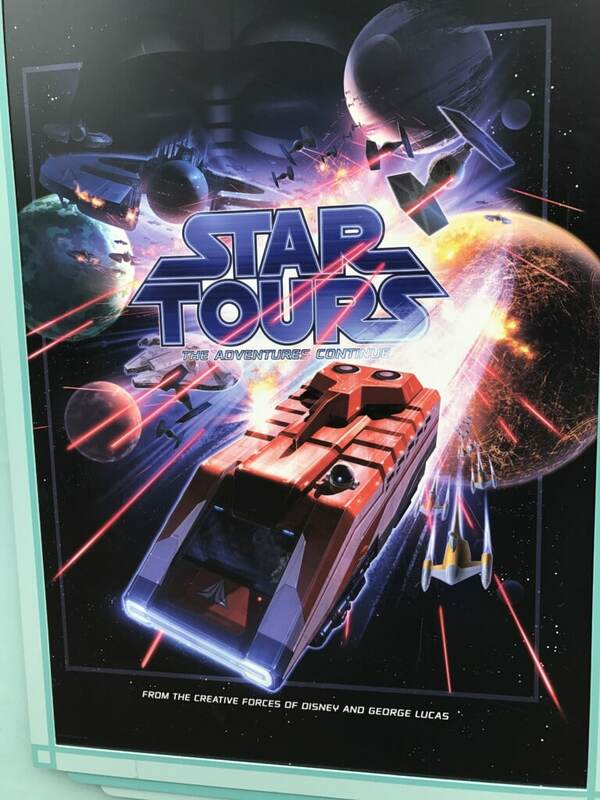 Star Tours! 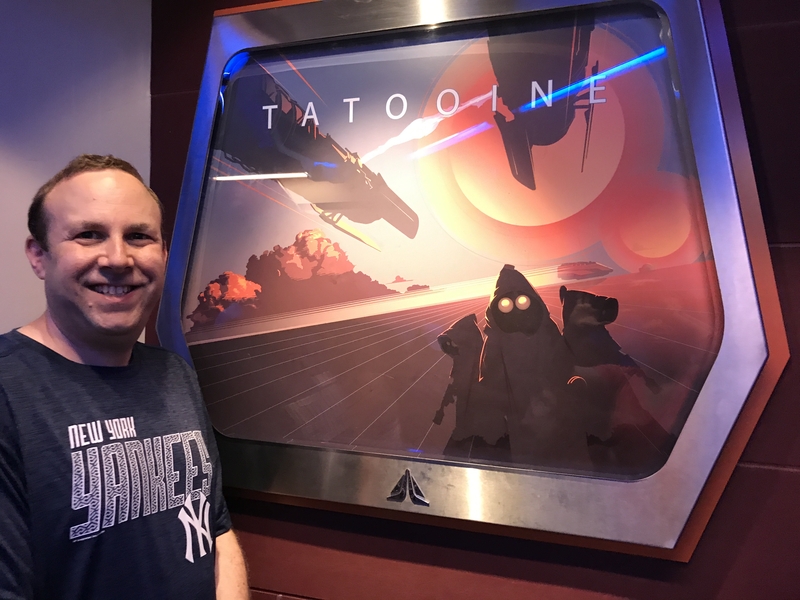 I’d heard all about the Star Wars ride at Disney Hollywood Studios but had never had the chance to go on it until now. 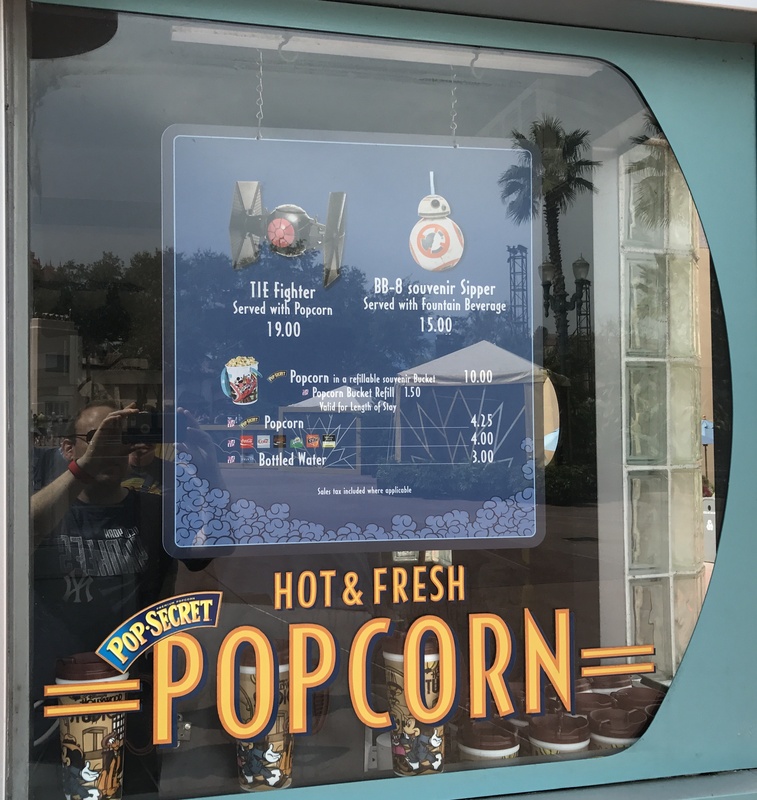 I knew we were getting close when we passed a popcorn vendor selling TIE Fighter buckets and BB-8 cups! I was soooo tempted to grab a TIE Fighter popcorn but I wasn’t sure how I’d possibly fit it in my suitcase to take home. Instead, we bought a standard popcorn with a refillable bucket. Totally worth the money since we must have refilled it a few dozen times over our entire trip. 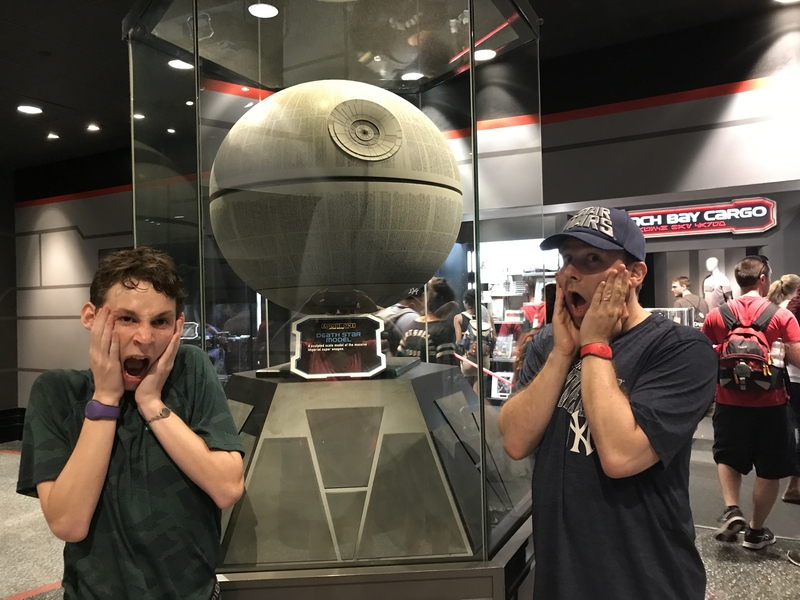 Faces stuffed with popcorn, we headed over to Star Tours! 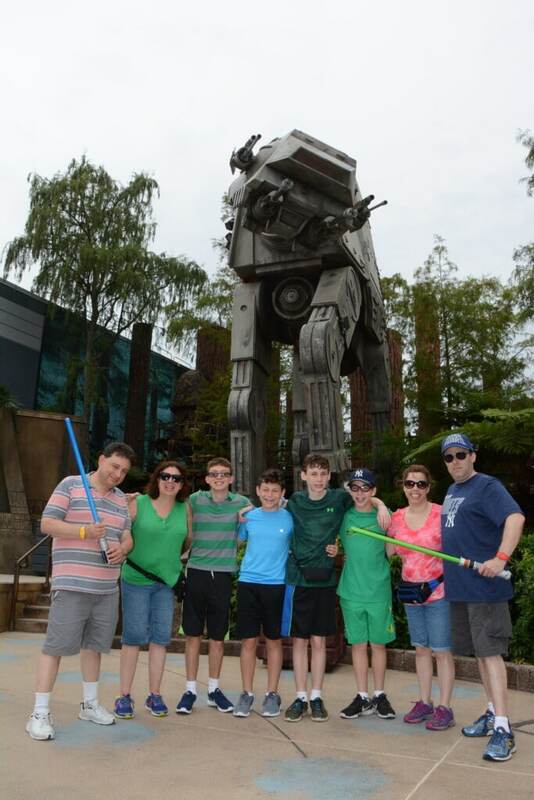 But first, we took a quick group photo in front of one of my favoritest Star Wars vehicles: the AT-AT! Waiting on line for the Star Tours ride, we saw a few familiar faces. 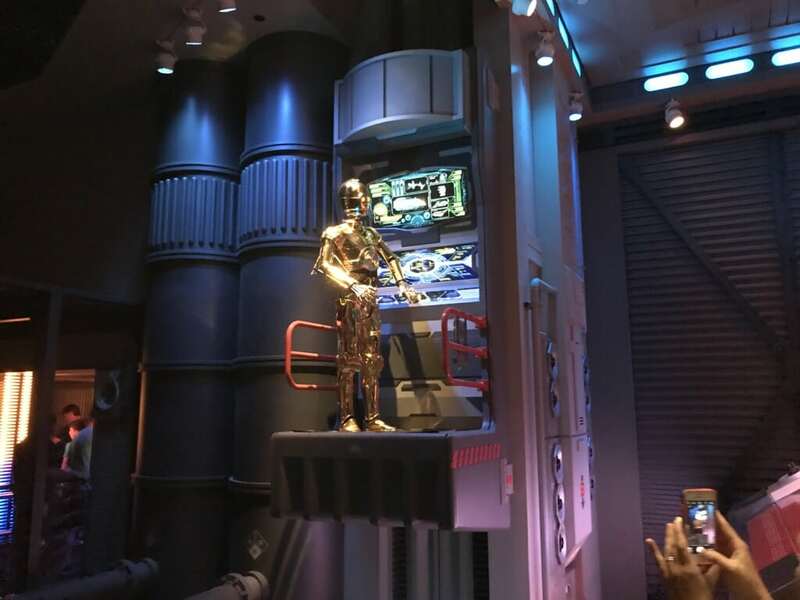 Like my buddy C-3PO. Y’know, he’s fluent in over 6 million forms of communication. 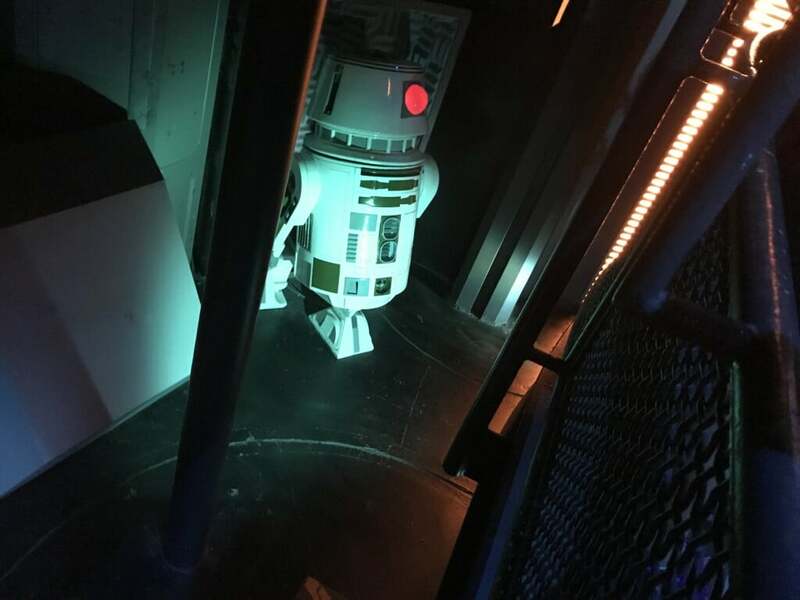 No, it’s not R2-D2, but it is another astromech droid. 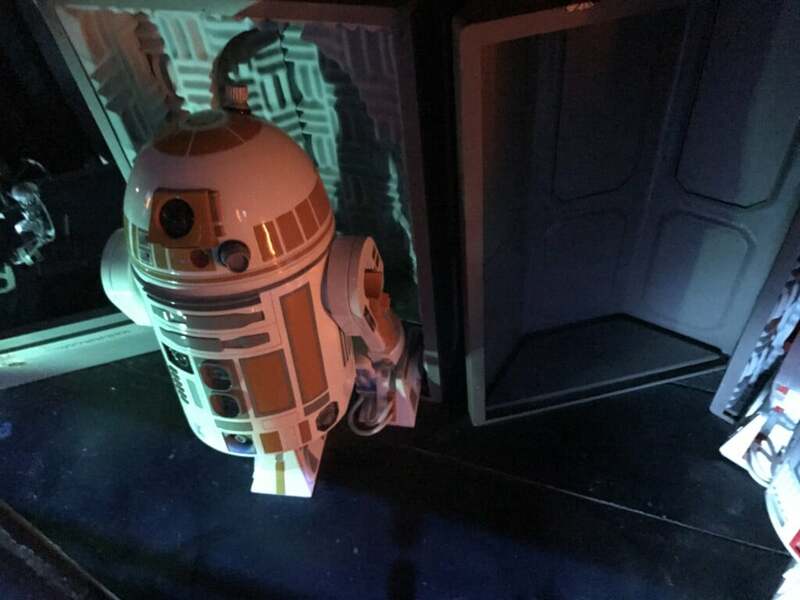 And another droid skulking about in the shadows! The Star Tours ride was pretty sweet I have to say. It’s one of those motion simulators (which sadly, get me a bit dizzy at times) that takes you right into the world of Star Wars, as members of the Rebel Alliance. I won’t give anything away except to say that we saw and survived an encounter with Boba Fett! I couldn’t leave the Star Tours gift shop without at least one purchase, right? So I grabbed myself a Star Wars hat. Fashionable and functional! 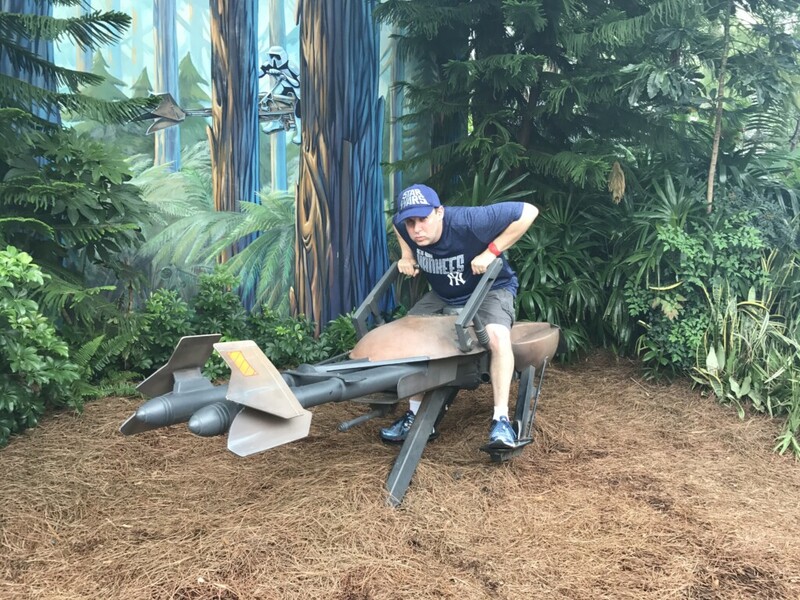 Somebody forgot to lock up their ride, so I decided to take this Speeder Bike for a quick spin around the park. Sure beats walking! Of course, the boys had to get their turn on it too. We shot this one just seconds before some angry dudes in white armor walked over screaming at us for some reason. 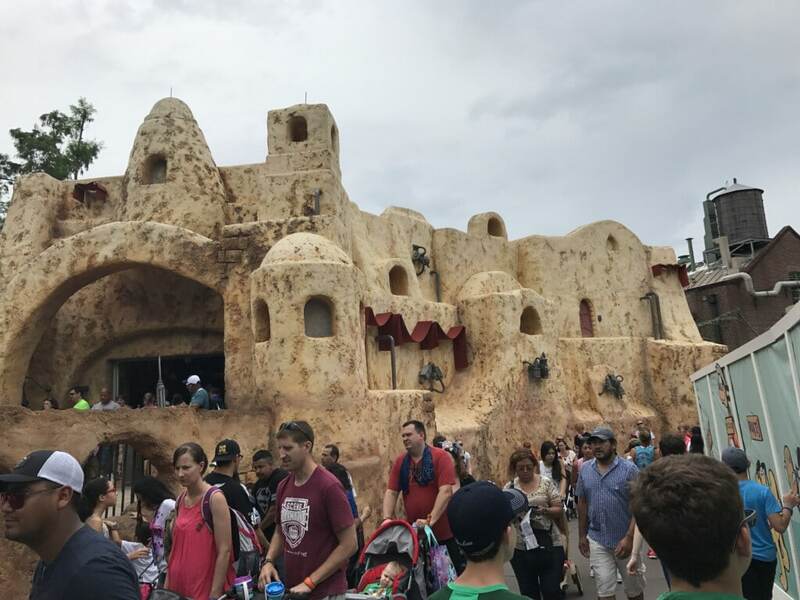 No, that’s not Tatooine, it’s just the Star Tours gift shop! 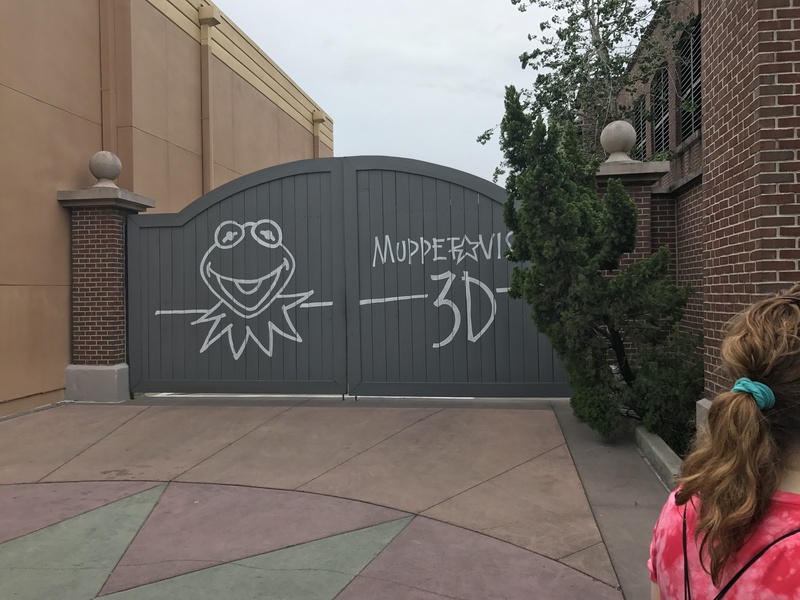 Next to Star Wars, my next favorite property at Disney Hollywood Studios had to be the Muppets! 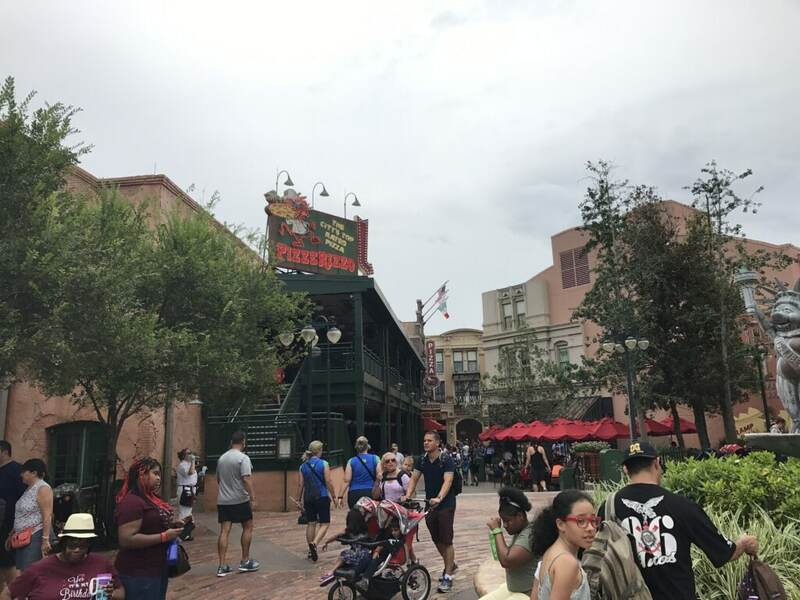 While we didn’t get a chance to eat at PizzeRizzo, it was still neat seeing the famous rat’s restaurant! 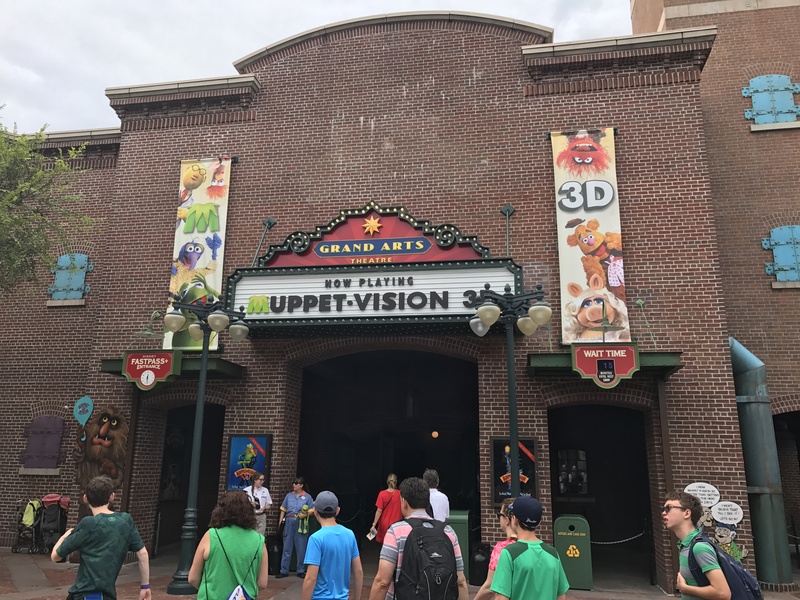 We made it to Muppet-Vision 3D! I think I could’ve spent all day here to be honest. After all, I have interviewed Muppets before! HAH! 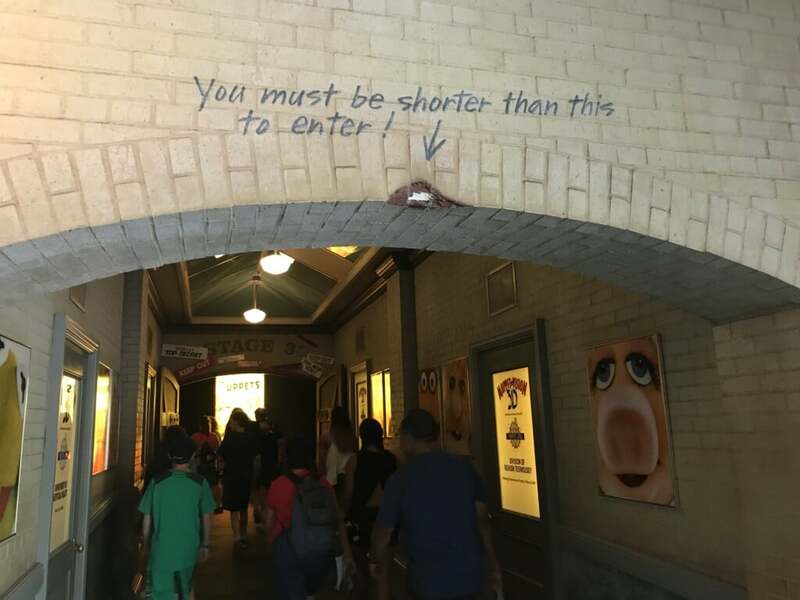 That little note in the archway… cracked me up. Oooh, we passed all kinds of secret rooms like the Muppet Labs! 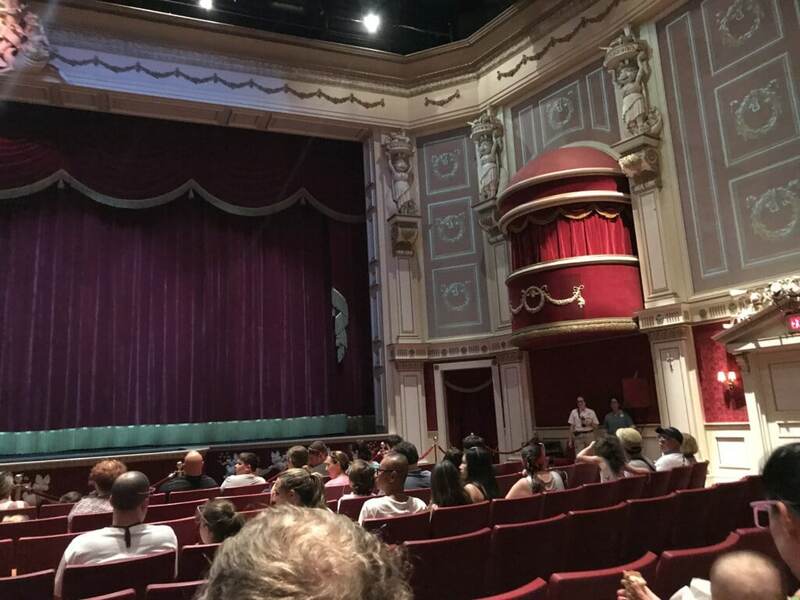 Just sitting in the real Muppet Theater was a treat! Gah! 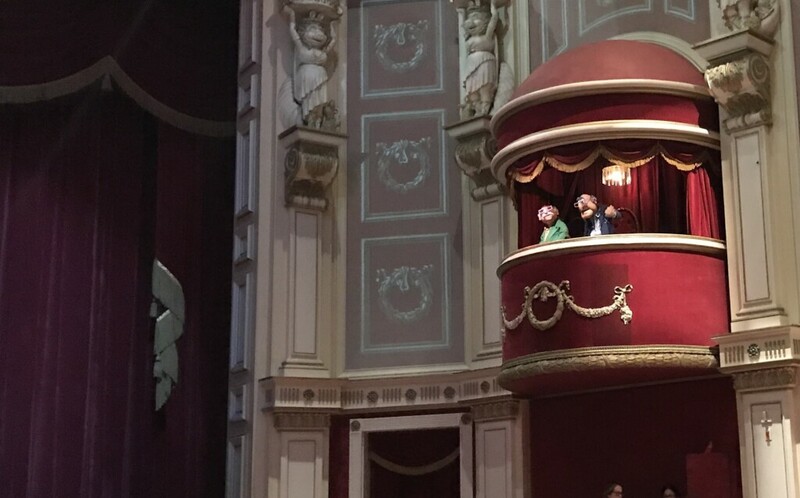 There’s those two old curmudgeons, Statler and Waldorf! You better believe they cracked jokes from start to finish too. I absolutely loved this one. 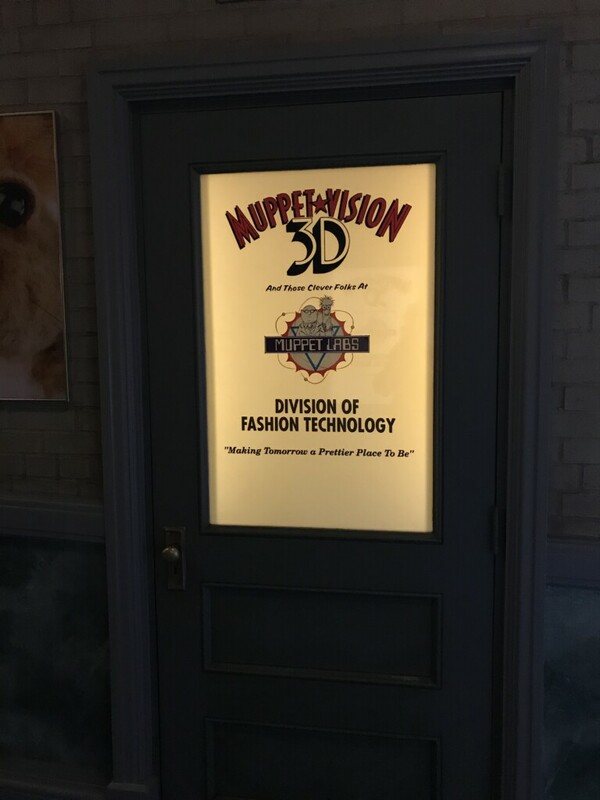 Not only was it true hysterical Muppets mayhem, but the Muppet Vision 3D effects were THE best 3D I have ever seen. No blurring. No over-the-top cheesiness about it. For the first time ever in a 3D movie, I really felt as if I was in it, not just watching it. 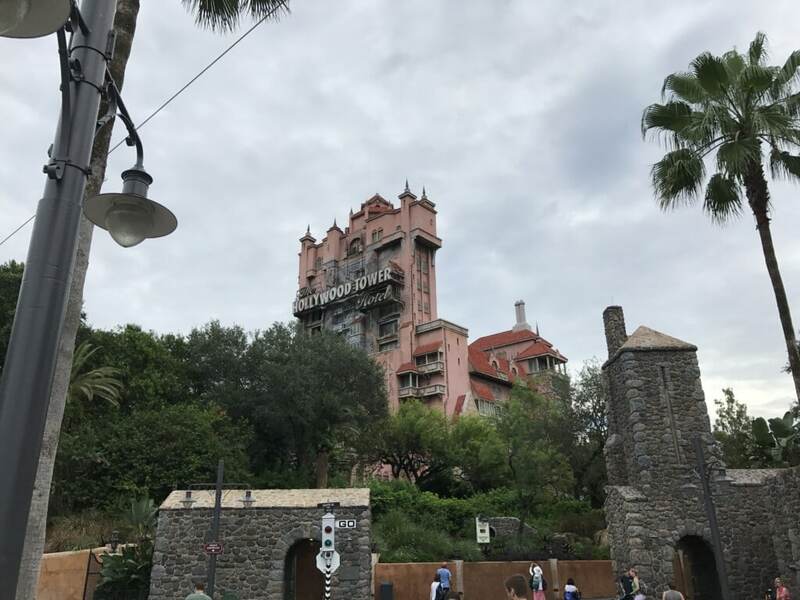 We visited a few more areas of Disney Hollywood Studios before it started to rain a bit. On the way out, I just had to stop at the Star Wars Launch Bay. 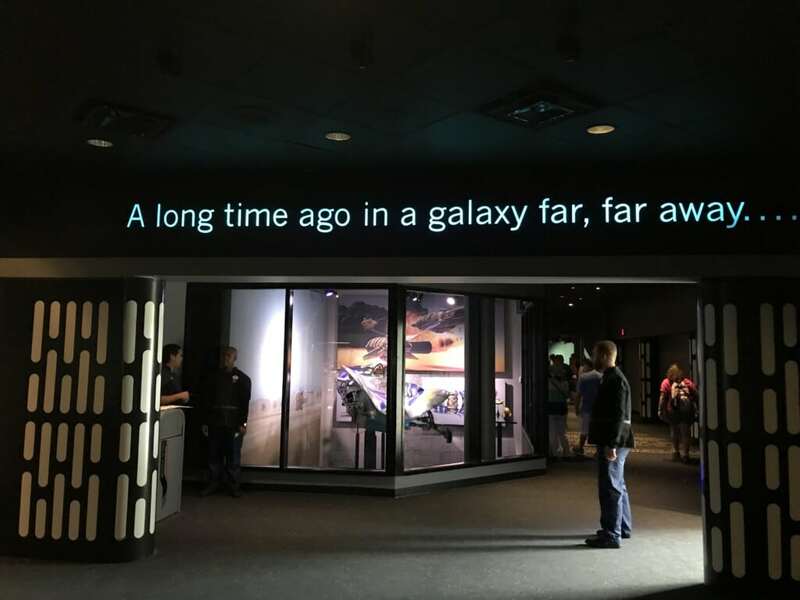 This was an indoor attraction where you could meet (and take pics with) popular Star Wars characters, see movie props and more. 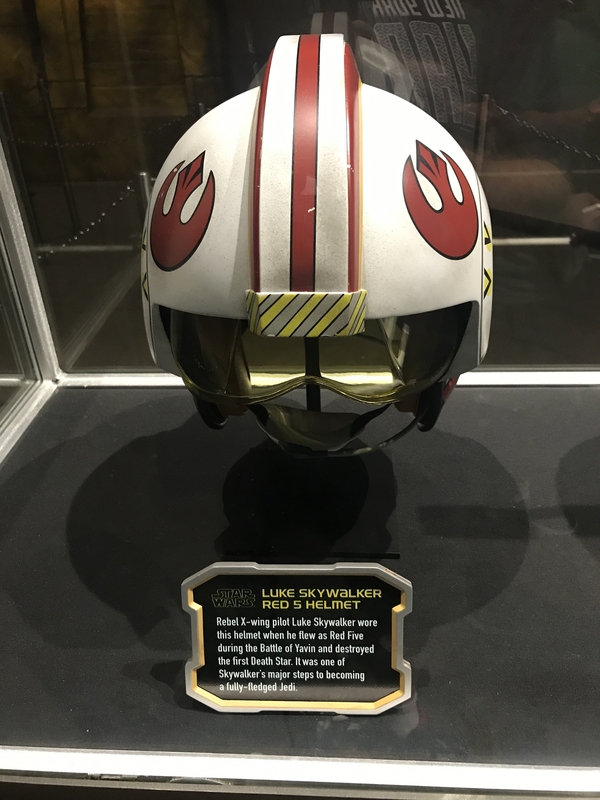 The helmet Luke used when he turned off his guidance system to destroy the first Death Star! 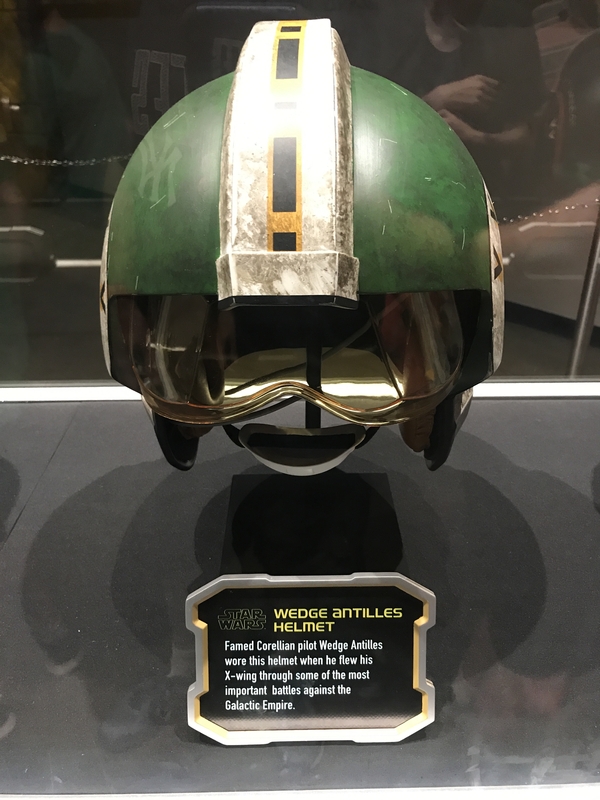 Even Luke’s buddy Wedge gets some… er, props. 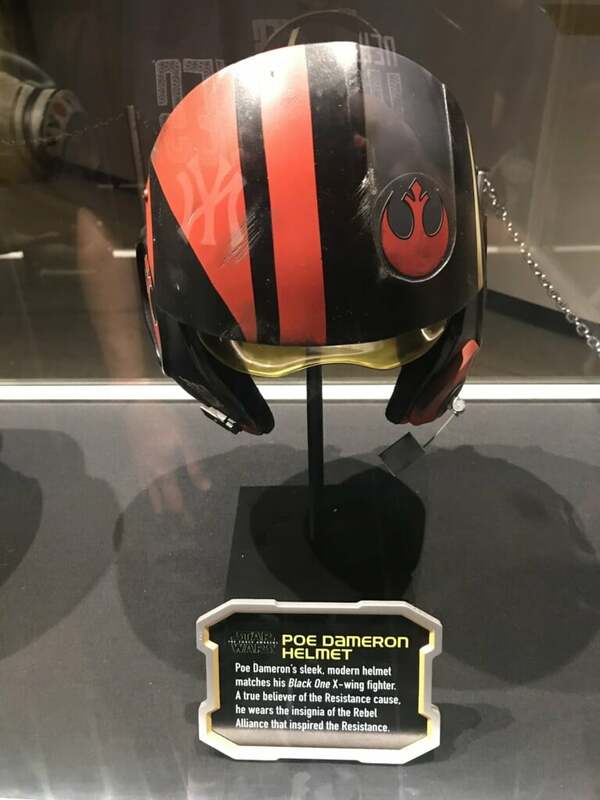 The fight for freedom continues with Poe and the Resistance! There were a bunch of The Force Awakens props and scenes set up, including this one of Rey and her Speeder. Utini! 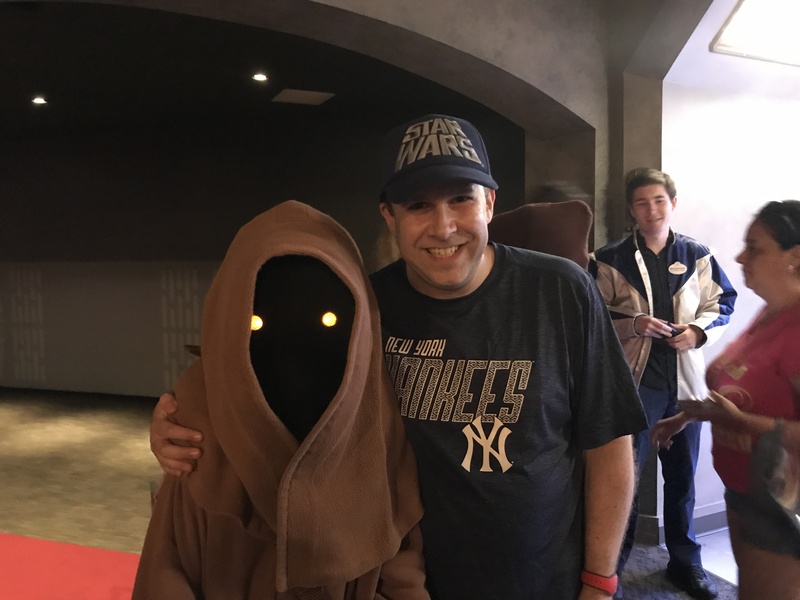 I bumped into this Jawa and just had to take a pic! True to word, these guys were extremely mischievous. We snapped this pic only after the little guy knocked the hat off my head and tried to steal my wallet. 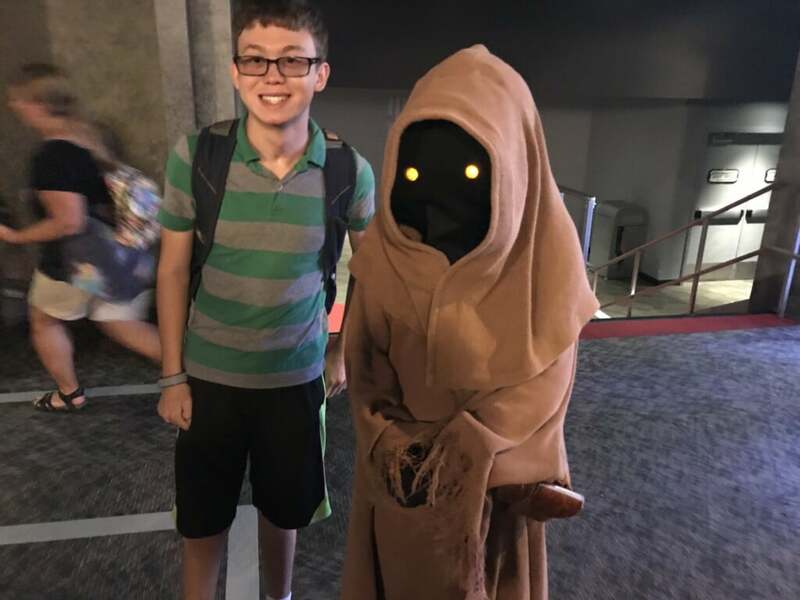 Matt was lucky to survive his encounter with a Jawa as well. For those with a sophisticated palate, the gift shop features Skywalker wine. 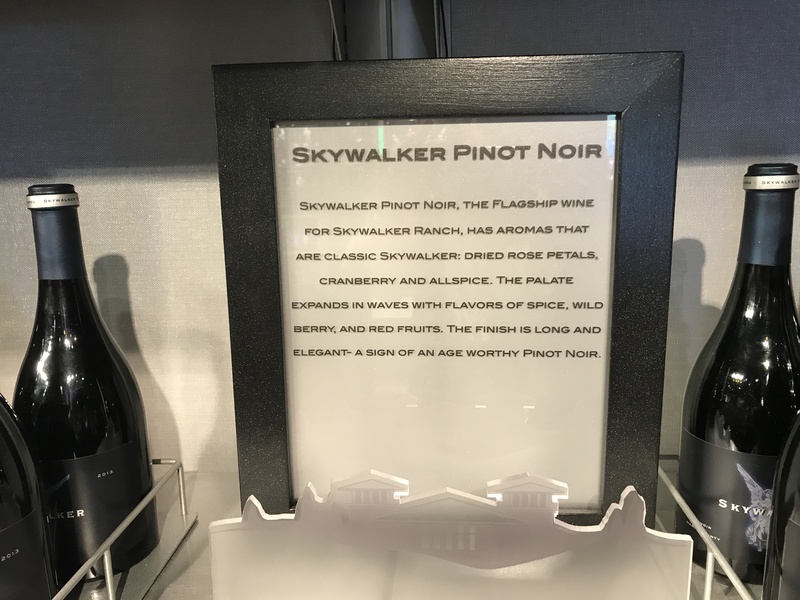 I guess we finally know what kind of “moisture” Luke and his family were farming on Tatooine. My kids had never seen a stunt show before and we were all pretty exhausted by this point. Up bright and early and walking around Disney Hollywood Studios in the crazy hot (and humid!) Florida heat will drain anyone. So sitting down for the Indiana Jones Stunt Show was the perfect solution. This show is an absolute blast. No pun intended. 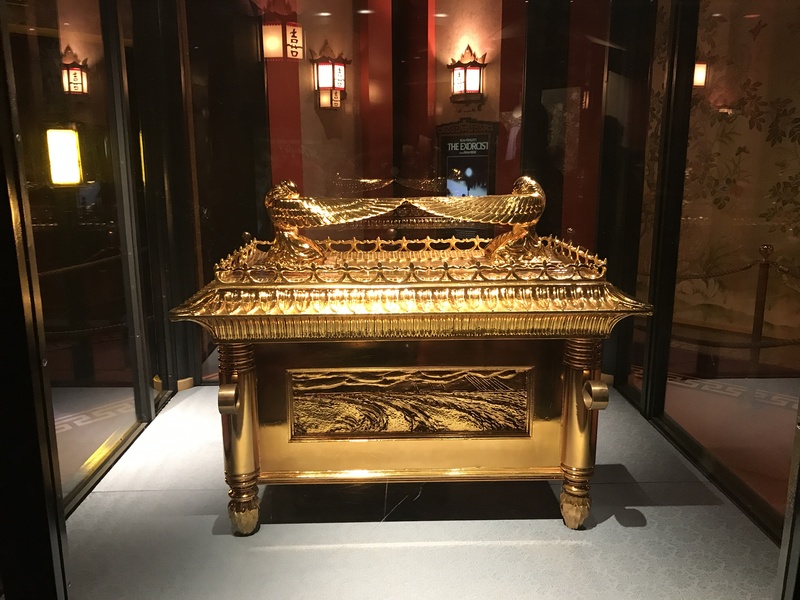 It’s a great way to go behind the scenes of a classic movie (Raiders of the Lost Ark) while being fooled and entertained all the while. There’s even opportunities for some fun audience participation. 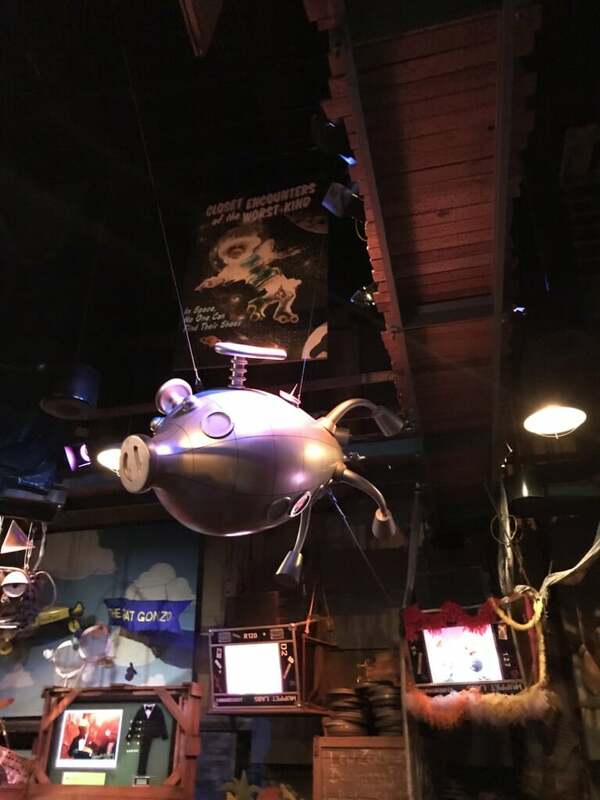 Not the best picture, I know, but that’s what you get when you eat at the Sci-Fi Diner! Tables are set inside old convertibles and all face the front of the restaurant where there’s a constant viewing of super, awful cheesy sci-fi films from the ’50s and ’60s. We’re talking the type where the army is taking on giant grasshoppers. Or the crazy awesome looking Frankenstein Meets the Space Monster. Yes, we were so enamored by that last one that I actually ordered the Frankenstein Meets the Space Monster DVD on Amazon and we recently watched the entire thing! 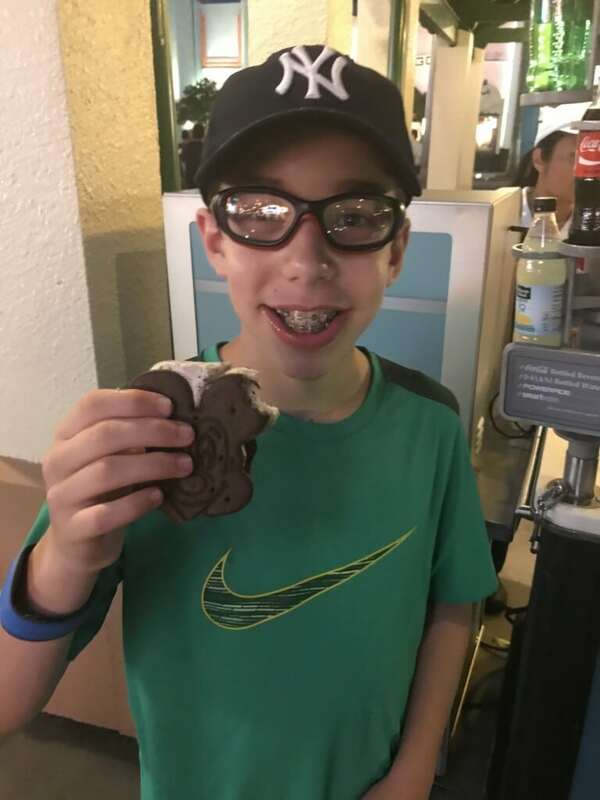 Both were delicious (hey, I had to “test” them before my kids ate them), but I went with the Mickey Mouse ice cream bar myself. It was a super sweet way to end an incredibly sweet day! 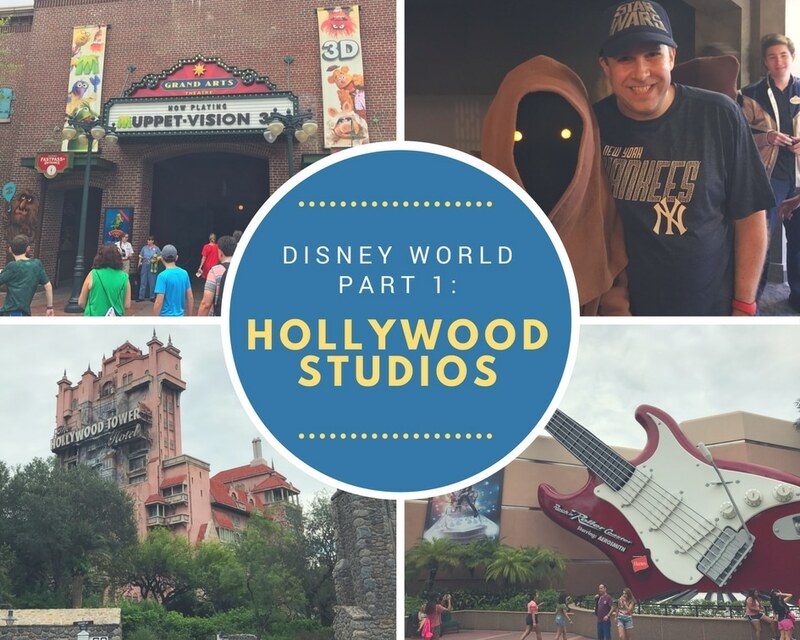 Man, I’m exhausted just recapping the highlights from our day at Disney Hollywood Studios. And that was just Day 1 of our Disney World Adventure! Next Up: Animal Kingdom! 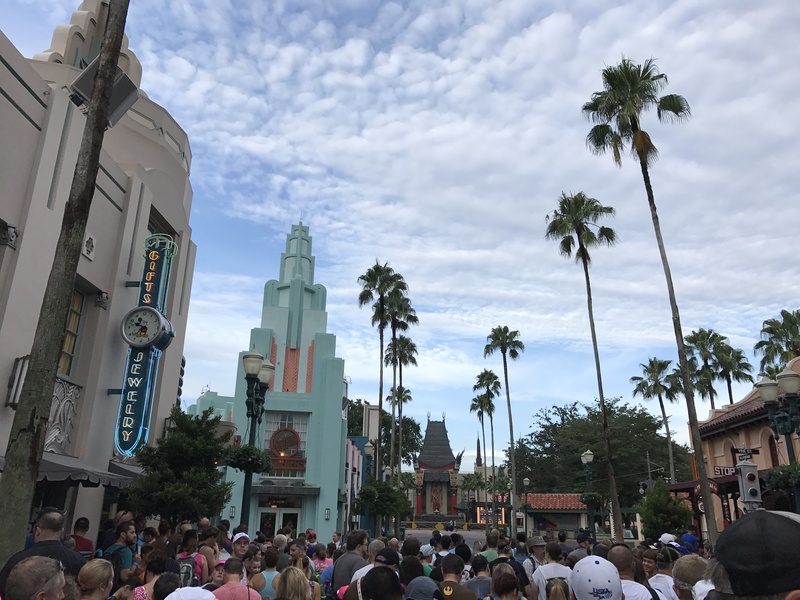 What do you love about Disney Hollywood Studios? Marvel's Inhumans is Literally Out of This World - And There's a Teleporting Dog! Loved the post. It really looked like you and your family had a lot of fun. 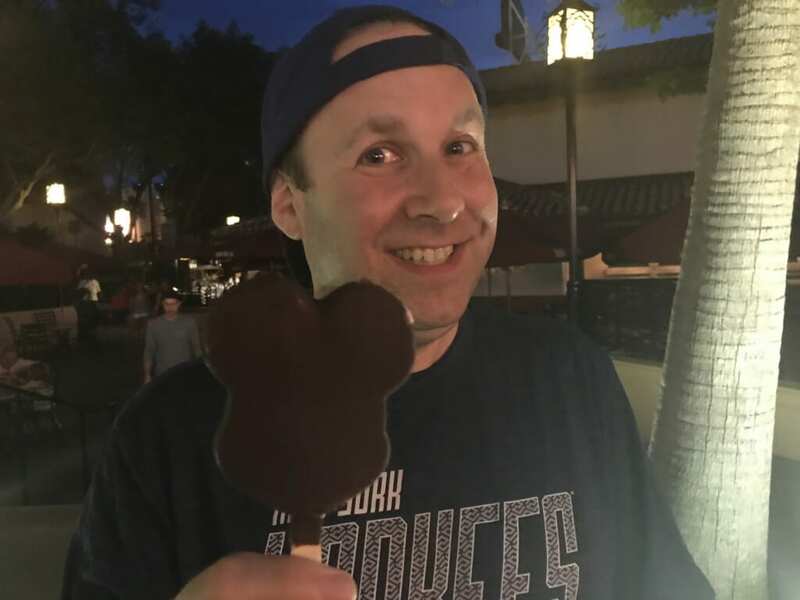 I haven;t been to Disney in a number of years, but after reading your post I think I am going to have to change that. Seems like you had such a great time! Reading this is making me want to go back right now! 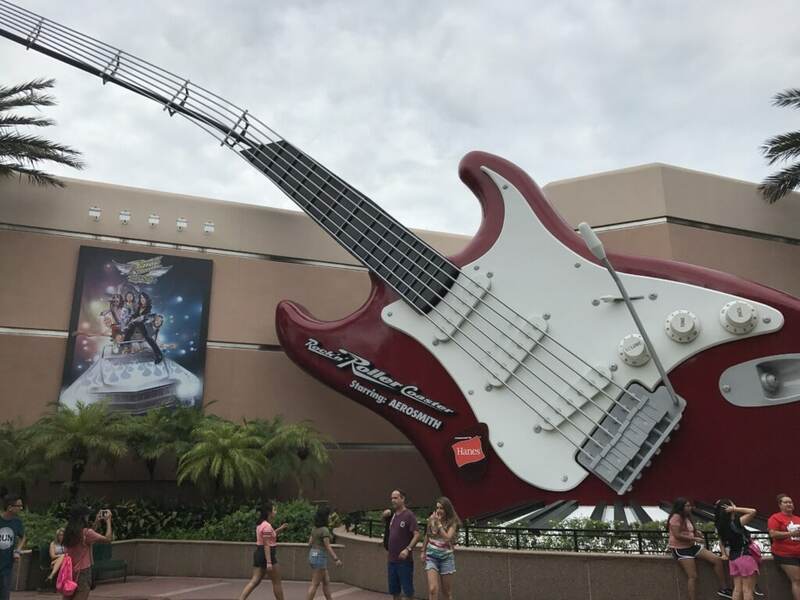 I cant wait until the girls are tall enough for the Rock N Roller Coaster! I miss that ride! 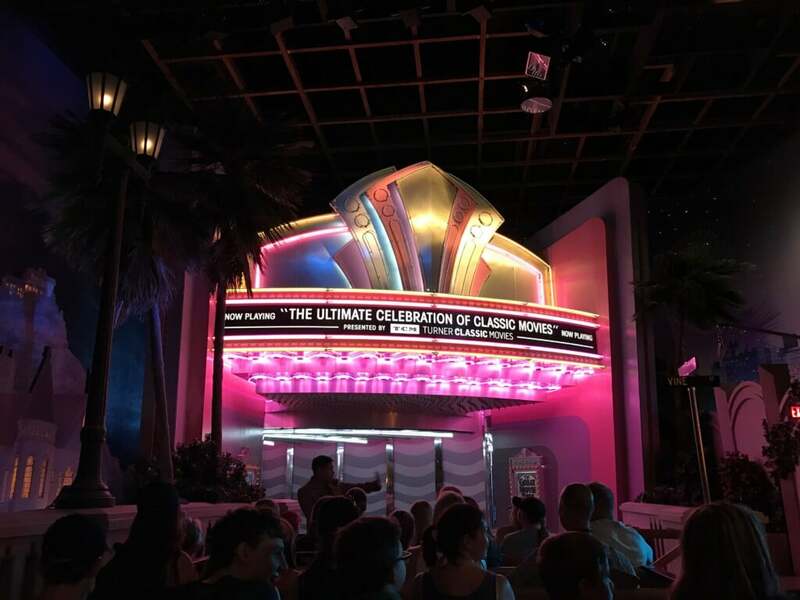 You are lucky you git to go on the Great Movie Ride before it closed – we missed it by a few days. It has always been a fave of mine, although the new Mickey ride should be amazing! 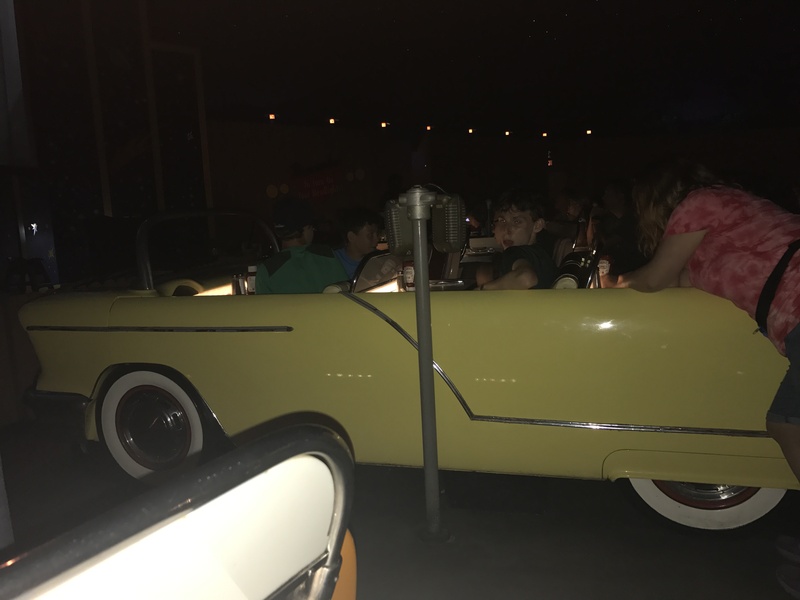 We ate at Sci-Fi Diner last week and it was so good we booked another dinner for our return in Feb! Cannot wait to read more about your trip! Hey, Tessa! Thanks for the comment. I know! Writing this post makes me want to go back right now!!! 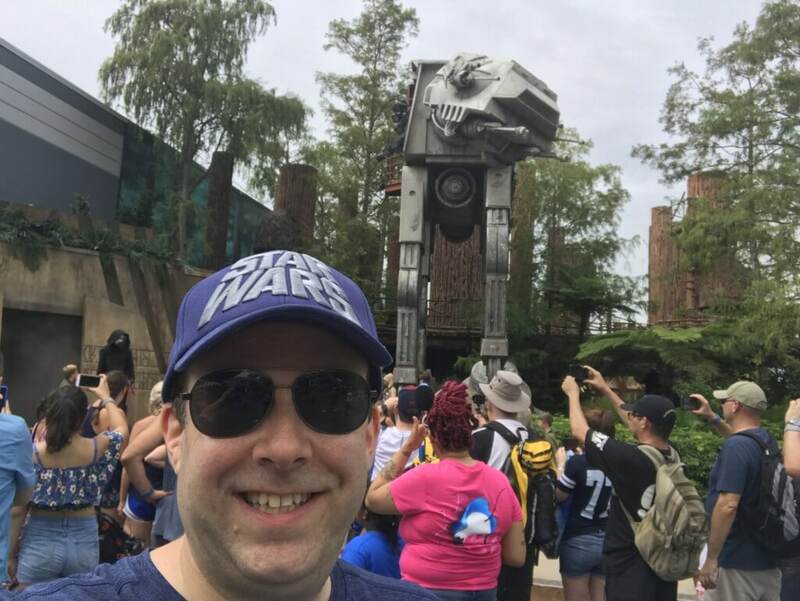 I can’t wait until Star Wars Galaxy’s Edge is done, so I can head back down and ride the Falcon!